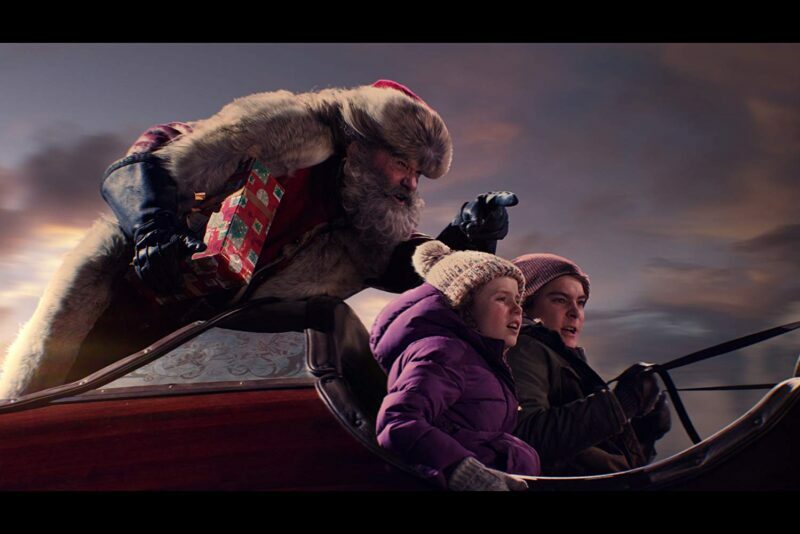 Kurt Russell, Darby Camp, and Judah Lewis in ‘The Christmas Chronicles.’ Image courtesy of IMDB. If you haven’t yet watched The Christmas Chronicles on Netflix, then I warn you, ahead there be spoilers. What do breaking-and-entering, grand theft auto, and kidnapping have to do with Christmas? Throw in a broken sleigh, a blues-singing Santa, and eight runaway reindeer, and you have all the makings of an epic Christmas movie. The Christmas Chronicles is one of several Netflix original movies to be added to the streaming service this season. It tells the story of two siblings, Kate and Teddy Pierce (Darby Camp and Judah Lewis, respectively), who have recently experienced the death of their father (Oliver Hudson). 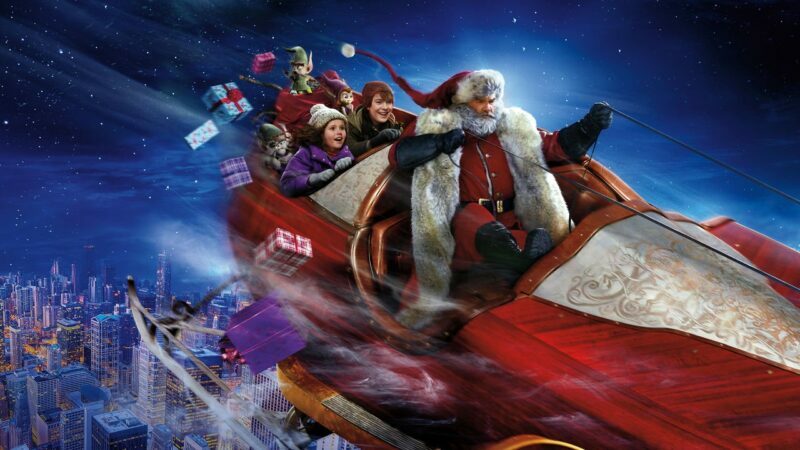 The movie opens with a montage of family Christmas movies of the past, ending with their last family Christmas. It is at this point we realize that we are seeing the videos through Kate’s eyes as she tries to reconnect with her now broken family. Kate decides to record her own video, but this one will be for Santa. Her efforts at convincing Santa that she was an almost good girl this year are interrupted by her brother Teddy, who has no time for his sister’s imagination. He considers crushing her dream by telling her that there is no such thing as Santa, but he just can’t do it. Despite the distance their father’s death has put between them, he can not bring himself to destroy his sister’s belief in Santa Claus. His father’s death has set Teddy adrift. He has fallen in with the wrong crowd and spends his time drinking beer and stealing cars. He is acting out and distancing himself from his sister. He does not want to believe in Santa, in Christmas, or in himself. His sister catches him stealing a car and records it on the video camera that she takes everywhere — the very same camera that her father used to record all their family Christmases. When their mother (Kimberly Williams-Paisley) is called into work on Christmas Eve, Kate uses the video she made to blackmail her brother into helping her catch Santa in the act of delivering presents. They create an elaborate setup, complete with video camera, Christmas cookies, and a jingle bell alarm system to wake them when the big man appears. The bells go off, and the chase is on. Kate and Teddy run outside and see Santa (Kurt Russell) leaping from house-to-house and disappearing into each in a cloud of red coal dust. They follow his trail and are stopped short by a wondrous sight floating above them: a sleek sleigh pulled by eight very amazing reindeer. In her effort to get a closer look at the sleigh, Kate climbs a pole, ignoring her brother’s pleas to stop, and she manages to tumble inside the cargo compartment of the sleigh. Teddy leaps for the sleigh and manages to get in and hide just as Santa returns and takes off. Kate startles Santa, and things go off the rails fast. Santa loses control of the sleigh, and the reindeer break loose and fly off. Santa guides the now reindeerless sleigh to a crash landing in Chicago. Upon landing, he discovers that the bag of toys and his hat, the source of his magic, are both missing. Without them, Santa is cutoff from the North Pole and any help. The first thing he must do is find the reindeer. But they need some transport to do that. The sleigh is out of commission, and there is no way to contact the elves to start repairs. Santa, with Teddy and Kaie in tow, goes to a nearby restaurant to procure a way into the city. Despite his best efforts, they leave empty handed, but all is not lost. Thanks to Teddy, who snags the keys from the valet, they manage to steal an already stolen car and begin their reindeer hunt with the police hot on their trail. Santa and Teddy drop off Kate to look for the reindeer and take off with the police in pursuit. Kate finds the recalcitrant reindeer, and Santa is arrested for grand theft auto. And before the police can stop him, he sends Teddy and Kate off with the reindeer to look for the sack of toys, which is the key to reaching the North Pole and the elves. With the help of Santa’s high tech tracking device, they finally locate the bag of toys. Kate crawls into the bag and is transported to the North Pole. Meanwhile, outside the bag, Teddy is accosted by thugs who steal the bag and abduct him. Back in jail, Santa is trying to convince the police of his identity but they understandably are not buying his story. They throw him into a holding cell just as all hell starts to break loose in the city. With Santa unable to deliver Christmas gifts, the Christmas spirit is seriously depleted, and the result is angry people, an extreme crime rate, and a very busy police department. The longer that Santa is kept from Christmas, the less Christmas spirit there is, and the bleaker the future becomes. Santa realizes he must do something to jump-start Christmas, so he uses the power of music… specifically, a blues rendition of “Santa Claus is Back In Town.” It is at this point that Kate, Teddy, and the elves show up and stage a jailbreak. Santa escapes, and it appears that Christmas is back on track, until Santa realizes that his window for saving Christmas is all but closed. But Kate and Teddy refuse to give up on saving Christmas, and they convince Santa to let them be his helpers. They devise a plan that will have Teddy driving the sleigh, Kate calling names and addresses from Santa’s list, and Santa delivering the gifts. Without having to carry his pack, Santa can slip in and out of the houses much more easily. 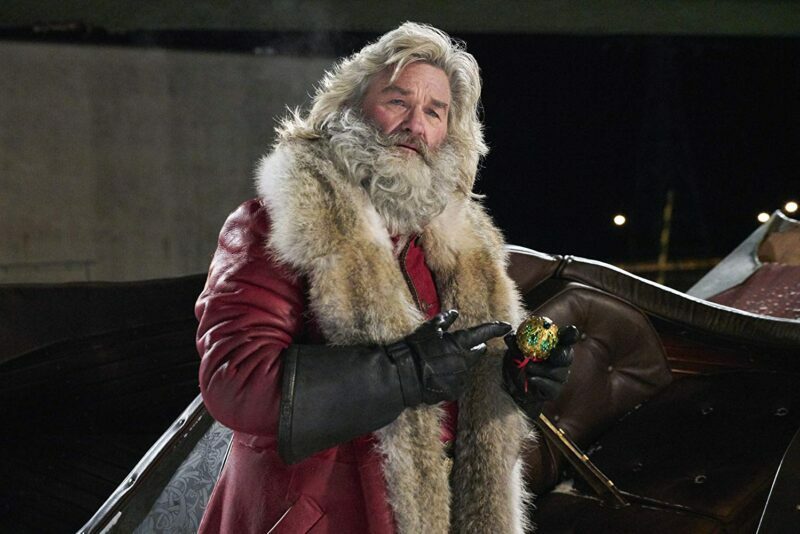 Kurt Russell as Santa Claus in ‘The Christmas Chronicles.’ Image courtesy of IMDB. They manage to get it all done, and Christmas is saved in the Saint Nick of time! This is a feel-good Christmas movie. Knowing that things would be made right in the end did nothing to dampen my delight. I thoroughly enjoyed this movie. The elves were absolutely adorable: think “minions” crossed with “mogwai,” and you get some idea of their personalities. The scene with the elves confronting the thieves reminded me a lot of the bar scene in Gremlins. Kurt Russell’s portrayal of Santa was equally delightful. He drives a sleek sleigh with some James Bond-inspired magic gadgets, and he breaks a few of the Santa stereotypes as well: he does not have a belly that shakes like a bowl full of jelly, and he definitely does NOT say, “Ho! Ho! Ho!” He also makes an excellent dark sunglasses-wearing blues singer. I couldn’t help but see him as a combination of Father-Christmas-meets-Jack-Burton (Russell’s character from Big Trouble In Little China), with a tiny amount of Snake Plissken (Russell’s character in Escape from New York and Escape from L.A.) mixed in for spice. Kimberly Williams-Paisley, Oliver Hudson, Darby Camp, & Judah Lewis in ‘The Christmas Chronicles.’ Image courtesy of IMDB. Do yourself a favor and treat yourself and your family to The Christmas Chronicles. I know you will enjoy it as much as I did. There is also a bonus at the end: Goldie Hawn appears as Mrs. Claus. Russell and Hawn have not shared romantic screen time since Overboard in 1987, so it was a real treat seeing them working together again.